Such deposits, if not removed by scaling, cause infection and loosening of the gums, ultimately leading to pyorrhoea and tooth loss. Scaling is a safe and routine procedure and does not damage the tooth surface in any way. It must be done by a dental professional. Dental plaque is a soft, sticky, colorless film of bacteria and food particles that constantly forms on the teeth. The bacteria colonize and multiply rapidly in this film and initiate infection in the gums, often resulting in tender bleeding gums. Scaling is a common non-surgical treatment for removal of infected deposits - tartar or calculus - from the tooth surface. These deposits if not removed lead to periodontal disease. In periodontal disease, the pocket between the tooth and gum begins to deepen. This provides a perfect environment for anaerobic bacteria to grow. 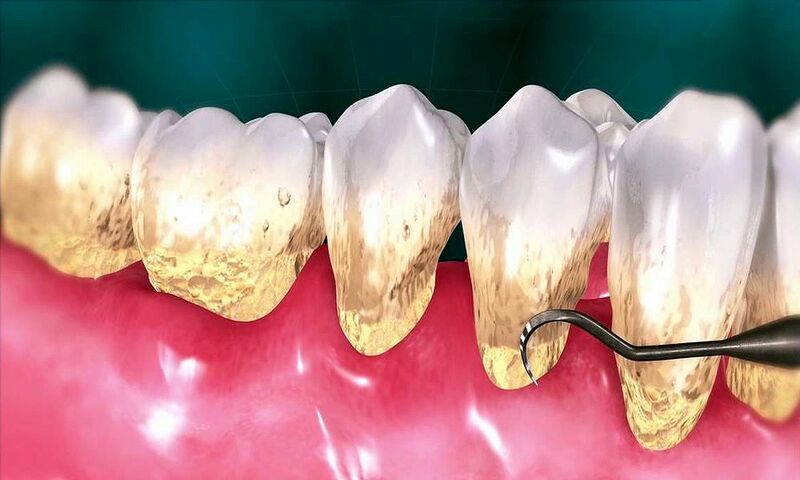 The bacteria begin to multiply rapidly and infect more of the gum and start dissolving the bone supporting the tooth. Plaque formation on the teeth is a continuous process. If this is not removed by brushing it starts mineralizing into tartar within 10-14 hours. Such persons may require periodic scaling, every 6 months or so.